If you spam, they will come for you. Image from GW. This week my Space Wolves blog has been bombarded with spam in the form of comments intended for link building to dubious online retailers and referral sites. Worse still, many of these spammers are succeeding in their nefarious activity. So, I'm going to explain what a negative impact spam can have on your blog and the blogosphere as a whole, as well as show you how to protect your blog from comment link spam. What is Comment Link Spam? Comment spam is when someone leaves a comment on one of your blog posts with the intention to link to their website, either by including an html link in the body of their content or in the name of their profile. How Does Comment Link Spam Work? The aim of spammers is to get links to their websites from trusted sources. In this case your blog. Sometimes this is for a basic link to strengthen their website. More often it's for a keyphrase link which will help their website to rank higher in the Google search results for that given keyphrase. So for example, a spammer trying to rank higher in the Google search rankings for the keyphrase "cheap warhammer" would call their profile name Cheap Warhammer with a link to their website on their profile name. 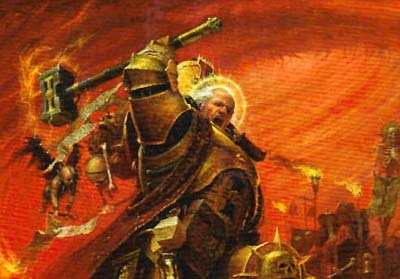 Or they can add some html code in their comment with their website address linked to from the phrase "cheap warhammer". Association: Google automatically associates your blog with any websites you link to. So if someone links to their 'buy cheap viagra' site from a comment on your blog, then you've just become associated with someone illegally selling prescription drugs. Similarly, if a website gets penalised for spammy practices by Google (like massed comment link spam), any sites that link to them also get penalised as a result. If your blog gets a fair amount of traffic from Google search results, I'll bet you're interested in protecting yourself from comment spam now! First, you need to change your Comments Settings if you haven't already. 1) Who do you want to be able to comment? I get a lot of anonymous people commenting on my blog, so I allow Anyone to comment. I don't want to kill the conversation and even selecting "Users with Google Accounts" doesn't seem to deter spammers. Do you want to manually approve all the comments on your blog? Or course you don't, it's really time consuming. All comments on my blog posts are automatically posted within 1 day of that post going live. This allows real people to have a discussion while spammers tend to discover blog posts a day after they've been published. By then it's too late for them to spam my blog, because their comments will need to be manually approved. Although some do still get through. This is REALLY IMPORTANT. Everytime someone comments on my blog, I get an email to my hotmail account. This helps me to spot the comment spammers from the real folks. Finally, make sure you've enabled Word Verification to keep the spam bots out! How Do I Tell Comment Spam from Real Comments? Sometimes it's hard to tell who's a spammer and who isn't. Some people are just shamelessly promoting their Warhammer 40K blog as well! So, to sort the good from the bad (and the fugly), I look through the comments that appear in my hotmail inbox. Take a look at this screenshot of my inbox. Dark Eldar is a comment spammer. The profile name "Dark Eldar" links to a dubious retail site that's trying to rank higher in the google search results for the search term "dark eldar". This is how it appears when I look at the comment in my Hotmail Inbox. Looks innocent enough right? Wrong! Once published, the name Dark Eldar appears with a link attached because they have used Open ID to leave their comment. However, you can only see this if you look at the published comment at the bottom of your blog post. Fortunately, if you have published some comment link spam, you can delete it afterwards by clicking on the dustbin icon next to the comment beneath your blog post. Googles Blogspot has a new feature where you can mark a user's account as Spam. I was being spammed by Cheap Auto Parts who managed to get a comment on one of my blog posts. But when I went to look at it to delete it from the front of my blog post, I found that Google Blogspot had automatically removed it! So if you want to help prevent Comment Link Spam, make sure you Mark any spammy users as Spam. Sooner or later, spam floods every corner of the world wide web. We've had an explosion in the number of blogs in our niche throughout the year, so it's no surprise that the spammers have come for us as well. So to protect yourself, your readers and your blog, keep an eye on your Comments. - A big thanks to Space Wolves Blog for sharing this with the rest of us. It can be a full time job keeping up with comments to make sure they are all legitimate ones. I know I've got to go through this site almost everyday and remove spam. Would you see this as Spamming? I ask - as I can easily stop this practice. Cheers, guys. This is really useful advice for all us new kids on the block. Thanks for taking the time to put it up! Tony: It's only spammy if it's a proper html link. But if what you're linking to is valid in the context of your reply (and the blog owner approves of it), then it's not spam, it's sharing Good Content. Thnaks for the info. Many of us new kids on the block are just looking for any sort of comment and might have missed out on this nefarious practice until it was too late. I guess this wasn't what I was expecting and perhaps confuses two separate problems. Spam is surely comments posted for any reason other than commenting on the article posted. So someone who posts advertising viagra or a way to make a fortune working from home is spamming your site. I subscribe to Akismet and I have found that service to be a really effective tool in reducing and almost completely eliminating spam comments of that type. As for people who include links? I don't know what the term is for that, I guess link abuse or something along those lines. But I think your advice is a little too vague to be helpful. How do you work out if a linked site is reputable or relevant? Do you only accept comments from people who run hobby blogs? What if someone who ran a gardening blog posted a comment, is that then spam because you don't think their site is relevant? Also, if someone who runs a hobby store is taking the time to post relevant comments on your blog is it really abuse for them to include a link to their site in their name? I guess I'm perfectly content for people to promote their own efforts on my site. There's no way I'd tolerate people posting junk about viagra or other scams, but if someone is willing to take the time to contribute including a link back to their own site seems fair enough. If it isn't then couldn't you explore how you determine the reputation of the linked sites a little better? Take the given example for instance. How did you know that the post by Dark Eldar was so bad? Did you visit the site, or use some sort of scoring service to determine it was disreputable? I guess I think you're penalising people who are just trying to integrate their site into the hobby blogosphere. Since I'd probably be the only one laughing if I replied with a spam comment, I'll just say this is a good post for anyone starting a blog. Interesting read, particularly as my humble little blog has some spam as well and I deal with it on a daily basis as forum admin! Good advice in your post, very useful even to old hands such as myself. My blog is apporaching its second year and thankfully, until recently, I've only had a couple of spammy comments in that time. However in the last month I've had three definately Spam comments left. I also use Blogger and their new spam filter caught them all and isolated them. Akismet from Wordpress. Its amazing, its catches 99.9% of all spam posts on my blog over 3k this year. And it has very very few false positives, of those 3k only 2 false positives that I know of. I also dont mind if bloggers post links back to their own blogs, if they are kind enough to post on my blog I'd love a way to find theirs and return the favor. So people with a link in their profile are spammers? I'm glad that this post has created a bit of discussion on the topic. As for people with links in their comments and trying to figure out whether or not it's "spam," I think it's more than just that. I know that I don't mind if people add a link to their comment if it fits one of two criteria. First, it's a link back to their blog or another that has relevant info (a specific product to help folks, a previous tutorial on a similar thing, etc.) and second, it's appropriate for the post content. The drug links or obvious links to non-related products are quickly dispatched as soon as they are found. As are comments with inappropriate language or comments that do nothing more than attack someone. In the end, spammers are looking for blogs they can exploit. If as individual bloggers and a community overall, we are watchful of what we comment and what we allow others to comment on our blogs, we make it tough for spammers to do what they do. mm... In wordpress there's a blacklist to put on hold comments with flagged words, like viagra, gold (for farmers) etc. In add, you also can block comments with more tha one link, I.E.. So when you are warned via email about that, you can check if it's really spam. And there are other stuff like approve the very first comment of a user to allow more comments. blogspot doesn't have anything like that? Thanks for the share. good work on this article.